Wang Z, Zhao Y, Wei H (2017). Chitosan oligosaccharide addition affects current-year shoot of post-transplant Buddhist pine (Podocarpus macrophyllus) seedlings under contrasting photoperiods. iForest 10: 715-721. Chitosan oligosaccharides (COS) have been used as modifiers to promote growth and mineral nutrient utilization in crop plants, but its over-year effect on current-year shoot (CYS) of juvenile trees is still unclear. In this study, Buddhist pine (Podocarpus macrophyllus) seedlings were cultured under natural and extended photoperiods with or without COS addition for one year. In the following spring, parameters of leaf length, biomass accumulation, and N content in CYS were found to be increased by COS addition under the extended photoperiod. P concentration of COS-treated seedlings was lower under longer photoperiod, but both N and P concentrations were negatively correlated with leaf length and biomass accumulation, suggesting the utilization of N and P for growth demand of CYS. The sole addition of COS mainly resulted in whole-plant P accumulation. However, when combined with the extended photoperiod, COS addition showed over-year effect on biomass accumulation and N content in CYS of transplanted Buddhist pine seedlings. Further studies are needed to confirm these results on other tree species. Assessing the effect of late-season fertilization on Holm oak plant quality: insights from morpho-nutritional characterizations and water relations parameters. New Forests 45: 149-163. Response of conifer species from three latitudinal populations to light spectra generated by light-emitting diodes and high-pressure sodium lamps. Canadian Journal of Forest Research 45: 1711-1719. Spring 2007 warmth and frost: phenology, damage and refoliation in a temperate deciduous forest. Functional Ecology 23: 1031-1039. Photosynthesis, leaf area and productivity of five poplar clones during their establishment year. Annals of Forest Science 51: 613-625. Effects of fertilization on media chemistry and Quercus rubra seedling development under subirrigation. Hortscience 50: 454-460. Evaluation of chitooligosaccharide application on mineral accumulation and plant growth in Phaseolus vulgaris. Plant Science. 215- 216: 134-140. Research on impact of chitosan oligomers on biophysical characteristics, growth, development and drought resistance of coffee. Carbohydrate Polymers 84: 751-755. Growth and photosynthesis of seedlings of four tree species from a dry tropical afromontane forest. Journal of Tropical Ecology 17: 269-283. Nursery fertilization affects the frost-tolerance and plant quality of Eucalyptus globulus Labill. cuttings. Annals of Forest Science 64: 865-873. Further studies in photoperiodism, the response of the plant to relative length of day and night. Journal of Agricultural Research 23: 871-920. Seaweed oligosaccharides stimulate plant growth by enhancing carbon and nitrogen assimilation, basal metabolism, and cell division. Journal of Plant Growth Regulation 32: 443-448. The 2007 Eastern US spring freeze: increased cold damage in a warming world? Bioscience 58: 253-262. Nutrition and bud removal affect biomass and nutrient allocation in Douglas-fir and western red cedar. Tree Physiology 19: 197-203. Seasonal-changes in the utilization and turnover of assimilation products in 8-year-old scots pine (Pinus sylvestris L.) trees. Trees - Structure and Function 8: 172-182. Preparation of chitosan oligomers and characterization: their antifungal activities and decay resistance. Holzforschung 66: 119-125. Chitosan oligosaccharide induces resistance to Tobacco mosaic virus in Arabidopsis via the salicylic acid-mediated signaling pathway. Scientific Reports. 6: 26144. Growth and anatomical parameters of adventitious roots foremed on mung bean hypocotyles are correlated with galactoglucomannan oligosaccharides structure. Scientific World Journal 2012: 797815. Biochemical response and induced resistance against anthracnose (Colletotrichum camelliae) of camellia (Camellia pitardii) by chitosan oligosaccharide application. Forest Pathology 43: 67-76. Nitrogen storage and remobilization by trees: ecophysiological relevance in a changing world. Tree Physiology 30: 1083-1095. Nutrient retranslocation in temperate conifers. Tree Physiology 9 (1-2): 185-207. Performance and nutrient dynamics of holm oak (Quercus ilex L.) seedlings in relation to nursery nutrient loading and post-transplant fertility. European Journal of Forest Research 128: 253-263. 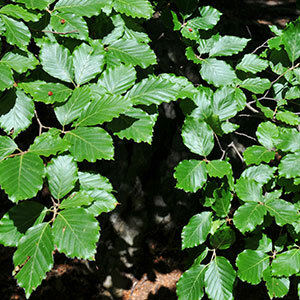 Fall fertilization of Holm oak affects N and P dynamics, root growth potential, and post-planting phenology and growth. Annals of Forest Science 68: 647-656. Exponential fertilization promotes seedling growth by increasing nitrogen retranslocation in trembling aspen planted for oil sands reclamation. Forest Ecology and Management 372: 35-43. Growth and development of Norway spruce and Scots pine seedlings under different light spectra. Environmental and Experimental Botany 121: 112-120. Daily and seasonal courses of gas exchange and niche partitioning among coexisting tree species in a tropical montane forest. Flora - Morphology, Distribution, Functional Ecology of Plants 209: 191-200. Seasonal dynamics of chlorophyll and microelement content in developing conifer needles of Abies sibirica and Picea abies. Russian Journal of Plant Physiology 56: 780-786. Nod factor (Lipo Chito-oligosaccharide) and its impact on nutrient uptake in maize (Zea mays). International Journal of Tropical Agriculture 33: 125-129. The role of stored carbohydrate and nitrogen in the growth and stress tolerance of planted forest trees. New Forests 46: 813-839. Growth of four northern conifers under long and natural photoperiods in Florida and Wisconsin. Forest Science 9: 115-128. Effects of chitosan oligosaccharides on the yield components and production quality of different wheat cultivars (Triticum aestivum L.) in Northwest China. Field Crop Research 172: 11-20. Effect of exponential fertilization on growth and nutritional status in Buddhist pine (Podocarpus macrophyllus [Thunb.] D. Don) seedlings cultured in natural and prolonged photoperiods. Soil Science and Plant Nutrition 59: 933-941. Prediction of nutrient leaching from culture of containerized Buddhist pine and Japanese maple seedlings exposed to extended photoperiod. International Journal of Agriculture and Biology 18: 425-434. Growth, nutrient uptake and utilization of Buddhist pine and Japanese seedlings to the extended photoperiod. Journal of Zhejiang University (Agriculture and Life Sciences) 42: 190-198.